Joan left her peasant life at age 17 to lead France against England in the Hundred Years’ War. Her goal was to reclaim the French throne for the Dauphin (rightful heir) Charles, Count of Ponthieu. Joan always admitted to being a girl. 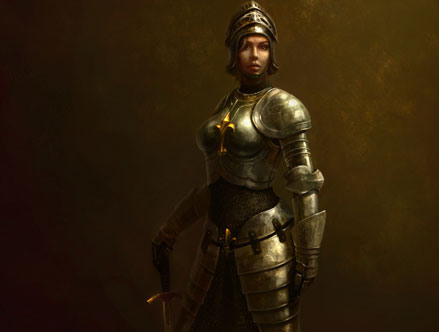 But, she was told she must take the dress and weapons of a knight to be successful in convincing the Dauphan to give her what she needed, so she dressed as a man. Charles tried to trick Joan by dressing as a commoner. She went to him without hesitation. Believing she had divine assistance he gave her horse, armor, sword, and put her at the head of an army. The English hid when Joan arrived at Orleans. On the 4th day another general attacked the English and was losing badly. Joan rode in waving her banner and rallied the French who routed the enemy. Though badly wounded, Joan led a second charge against the English to drive them from Orleans. She followed this victory by reclaiming the royal seat at Rheims. Charles was anointed King Charles VII. Joan stayed on as a general in Charles’ army, and was captured by the English within a year. They tried her as a heretic and burned her alive in Rouen. 25 years later her conviction was overturned.